Are you tired up with your daily routine? Then it is the time to relax your mind visiting the nearby hill station Mount Abu which refreshes you with its mesmerizing beauty. Just a few hours away from Udaipur, one needs a safer and comfortable cab service provider for covering the distance. Tixilo cab services being an experienced and well known online car rental service serves you the best in the most convenient way. Why to choose Tixilo cab from Udaipur to Mount Abu? Tixilo cab service is the most reasonable and reliable cab rental service of India. We care for your worries and value your money and time. You can book our online cab rental services through the website or mobile application. We at Tixilo provide you with a comfortable way of travel in a fair price. So book taxi online with the most economical taxi service of India. Tixilo taxi service ensures you an enjoyable and a safer traveling experience at pocket friendly rates you can trust on undoubtedly. It is a 163 km ride which will be a smooth commute with our one way taxi services. You do not have to panic, going out for booking tickets as cab booking from Udaipur to Mount Abu is now much easier with our online cab booking services. Your comfort is our priority and we take care for the higher comfort level of our customers. You can choose a car of your choice from our fully equipped range, and the can will reach reach your doorstep at given time sharply. We promise you a relaxing and satisfying travel. 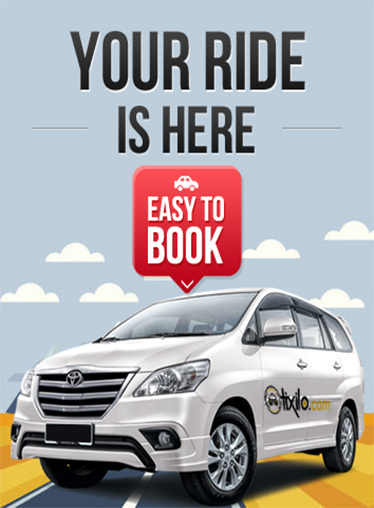 You can visit our site tixilo.com or you can also switch to our application for easier and faster cab booking in Udaipur. You won't have a second thought after knowing the benefits we offer.